Cepacol Lozenges, as Low as $0.49 at Walgreens! 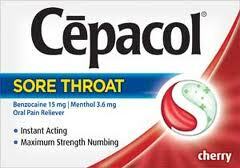 Cepacol sore throat lozenges are on sale this week at Walgreens! Use a printable coupon and earn Balance Rewards Points. Purchase two and receive 4,000 Points. 4,000 Points are worth between $4.00 and $5.00, depending on when they’re used. After the sale price, coupons and Points, these lozenges are as low as $0.49 a box!